Yesterday, I had a tree surgeon working n the garden. My usual one has stopped doing tree work (and is now a “tree consultant”) but one of his previous employees has taken over the business so I was able to use him instead. With two wet summers behind us, several trees and shrubs had put on a lot of growth so he (and his lad) were here for a few hours cutting back and putting the prunings through a chipper. I asked him to leave me some of the chipped wood to use. There was still a little left over so that went under a yew hedge as a weed suppressing mulch. We had a whole trailer-load left from our tree-surgeon's visit it - it included Juniper needles. Sadly, we couldn't use it due to its acidity, so it had to go in the garden waste bins at the Council tip! It has been put to good use in your garden, Andrew! Great job done Andrew. I agree with your comment about exercising caution when using fresh wood chippings and bark as a mulch as it can alter the chemical content of the soil, and create problems.It also initally contains high levels of Tannins.The same applies to some commercially produced work bark and chippings as it can be difficult to know when it was 'manufactured' and if it has 'matured'. 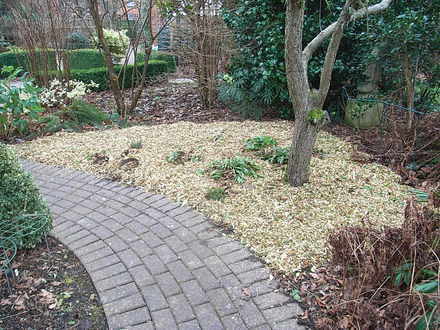 We have avoided using commercially produced wood chip and bark on our garden for the same reason. That is an interesting blog Andrewr, your pictures are lovely and show exactly what you've done. Also Spritzhenry's and Grenville's comments are interesting. I never thought of that before. Just as well we didn't invest in a mulcher. I bring my stuff to the green tip, which mulch it just the same, lol, but keep it probably for some time. I buy my mulch at a large garden centre and by the trailer load full. When that stuff comes home, I have to wear gloves ( always anyway when handling soil ) but this is also because the stuff is so hot....you almost burn your hands. It feels good, is lovely dark forest mulch and looks good on the flowerbeds. Your garden looks nice and tidy AndrewR. 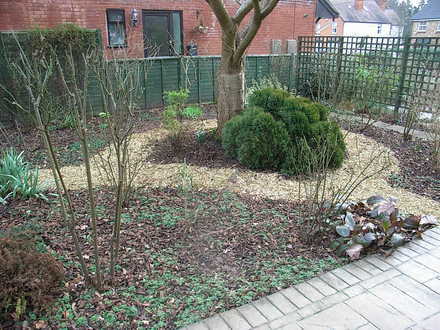 Andrew your garden looks lovely freshly mulched. I have a chipper / shredder too which takes care of my garden refuse. But, like you, I usually compost it after it is shredded. Last summer we did have to take a medium sized Douglas Fir down. All went in the chipper except for the trunk. The freshly processed chippings spent a week piled up and like Marguerite found, they were so hot in the middle they almost burned the skin. I used the fresh chippings to spread under a row of Douglas firs at the bottom of the garden as weed suppressant about 4 or 5" deep. Its worked wonderfully and the trees seem to like their shredded kin.....isn't that rather like cannibalism??? LOL. Very effective. I think bark and wood chippings make a very attractive mulch. I can just imagine what it will look like with spring flowers pushing through! Interesting blog.